Need a toggle switch on the stick or throttle: push it one way to avoid the other guy (ACAS), pull it the other way to automatically gun the other guy (AGUNS). Per the USN FY2019 Budget, the Blcok 4.1 will release in Q1 2021 and 4.2 in Q1 2023. TR-3 hardware redesign is required to support 4X processing growth factor based on the current processing estimates for all 3F capabilities. Redesign of TR-3 subsystems Integrated Core Processor (ICP), Aircraft Memory System (AMS), and Panoramic Cockpit Display (PCD)) configurations will contain new backplane technology, commercial operating systems, and modified middleware necessary to take the design of the TR-3 System through Critical Design Review (CDR). The TR-3 program will continue design toward Critical Design Review of the Integrated Core Processor (ICP), Panoramic Cockpit Display (PCD), and Aircraft Memory System (AMS). In addition the TR-3 program will prototype the middleware software that will enable F-35's new messaging architecture delivered as part of TR-3 and ensure compatibility with current F-35 sensors. Additionally the initial lab stand up will occur to ensure timely first article delivery to the production line in FY23. The USAF doc may have more info but they are historically late with their postings. Do the documents say anything about the incremental releases of software as they were talking about recently? Is this what is relevant from above? The F-35 FoM (Follow on Modernization) program is transitioning from its current form into the C2D2 program in 2019. The F-35 Joint Strike Fighter (JSF) Program will develop and field an affordable, highly common family of next generation strike aircraft for the United States Navy, United States Air Force, United States Marine Corps and International Partners countries. There are three variants the F-35A Conventional Takeoff and Landing variant; F-35B Short Take Off and Vertical Landing; and the F-35C Aircraft Carrier suitable variant. Maximum commonality among the variants, consistent with National Disclosure Policy, will minimize total air system life cycle costs. Planning and pre-development systems engineering for the Block 4 continues as Initial Operational Capability (IOC) is met for each variant during System Development and Demonstration (SDD). The JSF Continuous Capability Development and Delivery (C2D2) efforts provide incremental warfighting capability improvements to maintain joint air dominance against evolving threats. C2D2 capability requirements were initiated through ongoing Service-led operational analysis of warfighting gaps identified in the Fifth Generation Fighter Modernization Initial Capabilities Document (ICD), and through F-35 JSF Block 4 Mission Decomposition analysis completed in FY2014. These analyses serve as the basis for the F-35 Block 4 Capabilities Development Document (CDD), staffed through the Air Force Requirements Oversight Council (AFROC) and signed by the USAF Chief of Staff in January 2015. Joint Requirements Oversight Council (JROC) approved the CDD 21 March 2017. Modernization activities in FY2017 and FY2018 include systems engineering, risk reduction, and infrastructure upgrades required to deliver full Air System capabilities to support initial fleet availability of Block 4 upgrades in FY2021. 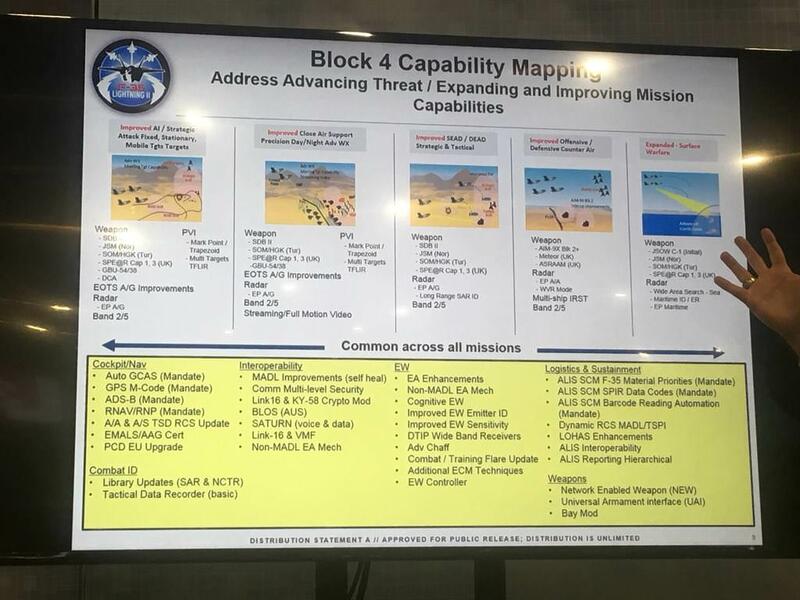 C2D2 efforts designated as Block 4 include a robust weapons integration portfolio and provide new opportunities for International Partners to assess, integrate, and field unique capabilities based on global sovereign requirements. The United Kingdom, Italy, Netherlands, Turkey, Canada, Australia, Denmark and Norway are participants in F-35 modernization. The program shown here reflects United States Marine Corps funding. Total funding for all Service and International Partners is reported at the accomplishment/planned program level since activities support all aircraft variants. Foreign Military Sales are ongoing separately. F-35 C2D2 provides continuing incremental upgrades of the three F-35 variants and associated ground equipment. Upgrades are essential capabilities for Air Interdiction and Strategic Attack, Close Air Support, Suppression and Destruction of Enemy Air Defenses, Offensive and Defensive Counter Air and expanded Surface Warfare. The C2D2 acquisition strategy is based upon incremental deliveries of capabilities. The strategy includes periodic deliveries with a focus on hardware, tech refresh and softwre. C2D2 capability planning includes an efficient transition from F-35 SDD to C2D2. As SDD development activities ramp down C2D2 will assume responsibility for improvements and modernization efforts. Hmm...unless I missed it, there's nothing in that slide about external fuel tanks. Is that being pushed back past Block 4? EFTs just require someone to pay for their dev & testing. Nothing on the F-35 itself needs to be changed besides a little coding to handle fuel transfers. vanshilar wrote: Hmm...unless I missed it, there's nothing in that slide about external fuel tanks. Is that being pushed back past Block 4? There are a lot of other higher priorities. As is, the F-35 already exceeds the range of EFT/CFT equipped legacy aircraft. Upgraded engines will further increase the range/persistence advantages. So, implying MADL apertures are currently used as EA mechanisms?